sigma delta modulation | Got e-? UPDATE! Code now bypasses so16() function which would have caused errors for you. 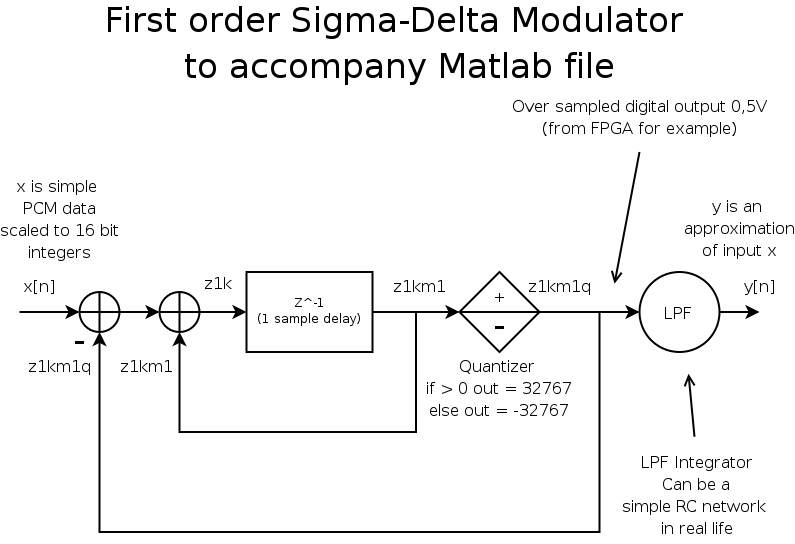 Well here is the first order Sigma-Delta Modulation code for matlab or octave . You will need to download the wav file, or use one of your own that has audio near 16kHz sample rate, and has audio between the first 2000 and 10000 samples. I cannot currently post wav files because wordpress will not let me. If you don’t want to mess with wav’s then you can use the square wave version. Go to: http://www.dailywav.com/0502.php Right click on the Space Ghost clip (whatsup.wav) file and do a save as to the same directory as the code. I would provide a direct link but they don’t seem to allow hotlinking. %    GNU General Public License for more details. This is a first order DSM. It uses an integrator to do noise-shaping and feedback to approximate the input. 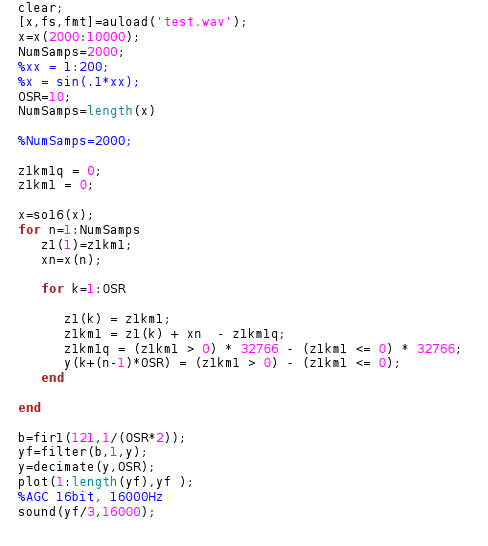 Basically it tries to match the output y[n] with the input x[n] by oversampling. The higher the oversampling rate, the higher the Signal to Noise ratio (SNR). A typical 4th order DSM can achieve nearly 90-100dB SNR if the oversampling rate (OSR) is around 45. So for 44100 kHz audio we would oversample at 1984500 Hz to achieve this SNR. Keep in mind the y[n] must be fed into a low pass filter. 1. It has a dynamic range that is basically only limited by OSR. 2. It works on Digital PCM (sampled) streams or analog data. Think of it as a guesser that can either output y[n] as a +1 or -1. The +1 or -1 is fed into an integrator many times faster than samples are arriving depending on the OSR. The integrator can be thought of as a summing device, in reality it is a low pass filter. Say your input sample is a 2 and the OSR is 5. I have some matlab/octave code that does a 1st order SDM on a wav file. I will post some of my code later in another post. I will post the block diagram for this soon on a follow up. The 4th order model and code/coefficients will also be included.